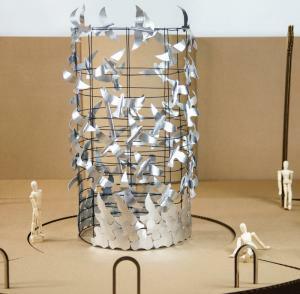 A model of the proposed sculpture piece submitted by artist Juanjo Novella. A trio of artists— each hoping to win a competition for the chance to create a new sculpture inside Town Field in Fields Corner— displayed models of their proposed works at a community meeting on Monday evening at the Vietnamese-American Community Center on Charles Street. One of the three will be chosen to execute the project by a 10-person committee led by Viet-AID director Nam Pham with a decision expected by next month. Visual representations of the proposed pieces will be on display at the Fields Corner branch of the Boston Public Library through Oct. 29. Models of the sculptures will be shown this weekend at the Vietnamese-American community center this weekend during Dorchester Open Studios (Saturday-Sunday, 12-5 p.m.). They may be viewed online here. Freedom's Nature: One of two proposals by Joe O'ConnellAbout 40 residents were in attendance at Monday evening’s meeting. The budget for the public art display is $250,000, which does not include site work which will need to accompany any one of the pieces. VietAID is responsible for raising the funds. "We will have to do a lot of fundraising," said Pham. "We will need support from everybody." The three finalists who met the community were drawn from a pool of 144 artists from across the U.S. and the world who responded to a request for proposals earlier this year. They were selected by a committee of ten people which includes localsrtists, VietAID’s director Pham, community residents, and a representative from the Boston Parks Department. "It will be extremely difficult for us to pick one," said Pham. "Tonight is a milestone in a three year journey." The artists were asked to focus their pieces on the community, unity and freedom while also paying attention to the existing landscape. "Many people from very different cultures have been through a lot to be here, a piece that represents this is very important,” explained Pham. Freedom Temple: Submitted by Anh TranAnh Tran presented a marble piece entitled The Freedom Temple. The 12 foot high, 6 foot wide structure would be carved out of a single piece of marble. Tran's work appears to be both joined hands and large wings depending on the angle it is viewed. Visitors would be encouraged to pass under it and gather around it. Tran is a Vietnamese-born artist with a Fine Arts degree with honors from The University of Hue and Masters of Fine Arts from Texas A&M University. Tran lived through the Vietnam war and has traveled extensively in his home country studying folklore and woodcarving. He has taught sculpture in many parts of the world. Another finalist is Joe O'Connell, who has submitted two pieces for consideration: Freedom's Nature and Freedom's Herald. Freedom's Nature was inspired by an M. C. Escher drawing of birds whose shape only becomes clear as they begin to rise and separate from each other. O'Connell's work would be of stainless steel construction and seeks to evoke a sense of rising and freedom and yet a lingering concern for the birds still striving for the top. Freedom's Herald, also by O'Connell, would also be constructed of stainless steel. It would be tower of language chosen from the community and when lit from the inside would cast unique shadows on the All Dorchester Sports League building. O'Connell founded Creative Machines in 1995 which employs 19 artists, engineers, and skilled craftspeople. His work is featured in the US, Canada and Japan. Juanjo Novella's piece is constructed out of the word "freedom" cast in inch-thick steel and written in every known language, although the artist admits he may have missed a few in the scale model. His red walls of text and open doorway invite passers by to maneuver the space in any direction they wish. The wave shape of the text walls mimics the road system surrounding the park. 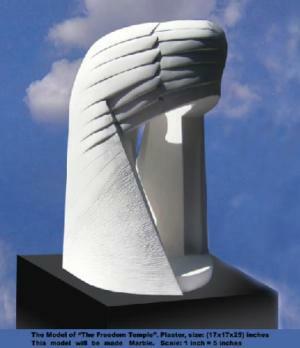 Novella works exclusively in the filed of public art as a sculptor and painter.